HAMILTON, BERMUDA--(Marketwire - November 21, 2008) - VistaPrint Limited (NASDAQ: VPRT), the small business marketing company, today announced a new way to get your friends and relatives into the holiday spirit with Caroling Caricatures e-cards. These e-cards allow anyone to create customized caricature carolers and set them up to sing and dance in various settings to a holiday tune of their choice. Customers can then send the Caroling Caricatures free of charge to friends and family, who may then create their own Caroling Caricatures. The holidays can be a stressful time for anyone and Caroling Caricatures are a quick and easy way to bring a smile to those you know. Using VistaPrint's popular caricature tool, visitors to the site can personalize every feature of their caricature, including facial characteristics, hair, accessories, and even jewelry. The fun doesn't stop at just one however -- up to seven caricatures can be added into one video. So you can "caricature" your whole family, office, or work crew. The animations are then added to an e-card and can be sent for free to anyone you wish. The caricatures can be as traditional or outlandish as your imagination desires. "The fun of our caricature tool really lies in creating animations that look just like the person you are designing them after. VistaPrint offers many options that allow you to personalize and capture the essence of each person from facial expressions to accessories," said Tiffany Price, associate product marketing manager at VistaPrint. "They are a great addition to any of our products, but the Caroling Caricatures animations are a way to take it a step further for the holidays. Sending a card that can make people laugh and smile is something that we know people want this holiday season." Customizing caricatures is simple with many options including hair styles, skin color, nose and mouth shape, and accessories such as glasses and jewelry. For an added holiday touch, carolers can wear a Santa hat, reindeer antlers or even a pilgrim bonnet. Caricatures can be an adult, child, baby or even pet, so the whole family can be included. Different songs and backgrounds can be added to the animation for another personalized touch. VistaPrint customers who have previously saved their own caricatures can import them into a card for a quick holiday greeting. Also, any caricatures that are created can be saved for use on other VistaPrint products. Caricatures can be included on many of VistaPrint's products including holiday cards, gift tags, note pads and T-Shirts. 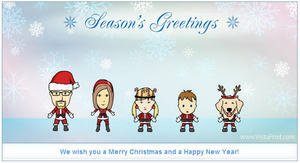 To create your own Caroling Caricatures card, visit www.vistaprint.com/carolers. VistaPrint offers small businesses peace of mind by providing everything they need to market their business. Products include high-quality and low-cost printed products such as holiday cards, brochures, check printing, and pre-inked stamps; promotional apparel including hats and T-shirts; and marketing services such as copywriting, Websites, design and postcard mailing. The company also offers a number of helpful videos and articles on marketing their small business in their virtual Learning Center. VistaPrint Limited (NASDAQ: VPRT) is the small business marketing company having served over 16 million customers world-wide. VistaPrint offers small businesses everything they need to market their business with brand identity and promotional products, marketing services and electronic marketing solutions. A global company, VistaPrint employs more than 1,600 people and operates 19 localized Websites serving over 120 countries around the world. A broad range of marketing products and services are available online at www.vistaprint.com. VistaPrint's products are satisfaction guaranteed. VistaPrint Limited today announced a new way to get your friends and relatives into the holiday spirit with Caroling Caricatures e-cards. VistaPrint Limited today announced a new way to get your friends and relatives into the holiday spirit with Caroling Caricatures e-cards. Make yours today at www.vistaprint.com/carolers!